A scientific caravan consisting of 12 high school students, university students and lecturers returned home after a seven days journey to Switzerland where they visited some of the most prestigious scientific institutions in the world, including CERN in Geneva and the Paul Scherrer Institute in Zurich. The caravan was organised by Sirius Astronomy Association with support from the Municipal Council of Constantine. It was part of the Cirta-Science Competition, which is held every year across 51 high schools in the Wilaya and rewards the top 3 students with trips to various destinations with scientific significance. This year’s prize was a trip to the LHC, the largest particle accelerator in the world that allowed the discovery of the famous Higgs particle in 2012, the holy grail of modern physics. Across a journey of over 1000 kilometres through Switzerland, the group of explorers visited PSI in Zurich, Einstein’s apartment in Bern where he lived during his working out of the theory of relativity, Switzerland’s most powerful nuclear reactor in Leibstadt near Basel, as well as various historical and cultural sites and natural landscapes in this fascinating country. The highlight of the journey was definitely our visit to the LHC, this gigantic installation for the study of sub-nuclear physics, with its tunnel that spans 27km in circumference at the border between Switzerland and France. Our visit was much like that of an official delegation. Not only did we visit all major facilities within the installation (such as the synchrocyclotron, the caves that hold the two giant detectors located at 100 meters underground ATLAS and CMS), but our young scientists also held a roundtable discussion with top CERN administrators and very well known physicists such as John Ellis, as well as all the Algerian scientists who currently work there. Another emotional highlight was the powerpoint presentation that Ouail Kitouni, a student from Fadela Saadane High School, gave to the discussion panel, and in perfect english. He presented a historical analysis of the genesis of the grand unified theories as well as the epistemological consequences of the recent discovery of the Higgs at CERN. The presentation was followed by a lively discussion with the present scientists. Our delegation also visited the AMS’s control centre, the largest detector of primary cosmic rays aboard the International Space Station, which is controlled from CERN. Many thanks goes to Dr. Kate Shaw from ATLAS for her dedication in organising this particular visit and our colleague Rachik Soualah, also at ATLAS, for his valuable assistance. The next stop on our journey through the hinterland away from Geneva brought us to the largest science centre in Switzerland, the Paul Scherrer Institute (PSI) near Zurich. The institute employs over 2400 full time scientists and focuses on all aspects of nuclear, atomic and molecular physics, nanotechnology, and various scientific applications ranging from fundamental physics to biochemistry, restoration of manuscripts, etc. Our delegation was taken through PSI’s various facilities and installations, guided by the scientists working at the institute themselves. Our visit to this region ended at the fifth most powerful nuclear reactor in Switzerland, which is situated in Leibstadt, 45km north of Zurich. This part of the visit was coordinated with Dr. Dokhane, PSI staff and honorary member of Sirius. Back in Geneva, we concluded the visit by a trip to the Astronomical Observatory of Geneva a little north of the city, including a visit to the 70cm telescope dedicated to the search for exoplanets and a number of other installations. The cultural part of the visit led us to experience a unique European system of governance based on consultation and active citizen participation. We were taken through the chamber of the Grand Council where laws are usually discussed just prior to the Ministers’ session. We took their seats and sifted through the pages of pending bills and agendas. There is indeed nothing more pleasing than transparency and the involvement of citizens in the decision making process. Another founding principle of Swiss institutions is neutrality in political and even philosophical terms. A long visit at the museum of the Red Cross and the ICRC allowed us to explore the endeavours undertaking by Switzerland to promote peace and limit human suffering during armed conflicts. The young students were able to scrutinise the records of correspondences between prisoners from World War 1 to the war in Afghanistan, they learnt about the genocides of the 20th century such as that of Rwanda and listened to testimonies from victims of all ages who suffered through these senseless and dehumanising conflicts. Visiting the Bastions, a historical place in Switzerland’s memory, naturally led us to the University of Geneva and in particular to its prestigious library, founded by John Calvin himself in 1559. The library contains a unique collection of manuscripts including around two million books and manuscripts, some dating back to the 15th century. We were guided by the Chief Curator herself as well as Mr. Bouzouzou who is responsible for the Arab and Islamic manuscripts. Together, they took us to the depths of the archives to discover astronomical manuscripts dating back to Kepler and a number of other treasures of human thought. Our long journey of over 1000 km through Switzerland then led us to Berne, the federal capital. This is where Einstein lived during his Annum Memorabilia where he articulated the theory of relativity and the quantification of light. Our young delegates spend a good hour strolling through the historical apartment-turned-museum, hoping to catch the indescribable stench of inspiration that may still float in the air. A day in Berne, this charming city and compendium of medieval history, cannot do justice to all the cultural and historical treasures it holds; its archways and its fountains. We nonetheless managed to see the Clock Tower (the Zytglogge) with its delicate astronomical mechanism, Berne’s Cathedral, the monumental Gothic church with the highest bell tower in Switzerland, and its impressive pipe organ and exquisite stained glass, and even witnessed a rally for illegal immigrants. Our delegation also felt the pulse of the Muslim community in Switzerland. We visited the Islamic Centre situated near Lake Léman and the first Muslim place of worship in Switzerland founded by Sheikh Said Ramadan during his forced exile from Abdel Nasser’s Egypt. We were received by the director of the centre, Dr. Hani Ramadan, in the same room where contemporary Muslim figures such as Malcolm X were received. At the heart of a long exchange, we enquired about the situation of the Muslim population following the rise of the right and growing Islamophobia in the country. We also visited the Great Mosque of Geneva, one of four mosques in Switzerland with a minaret, where Imam Sheikh Sofiane took us around its various pavilions. Finally, we performed the Friday prayer in Germany at a mosque run by the Turkish community. As a minority living in a somewhat difficult situation, the Muslim community are increasingly visible, most are well integrated and do represent the diversity of Switzerland, though not sufficiently engaged in public life. 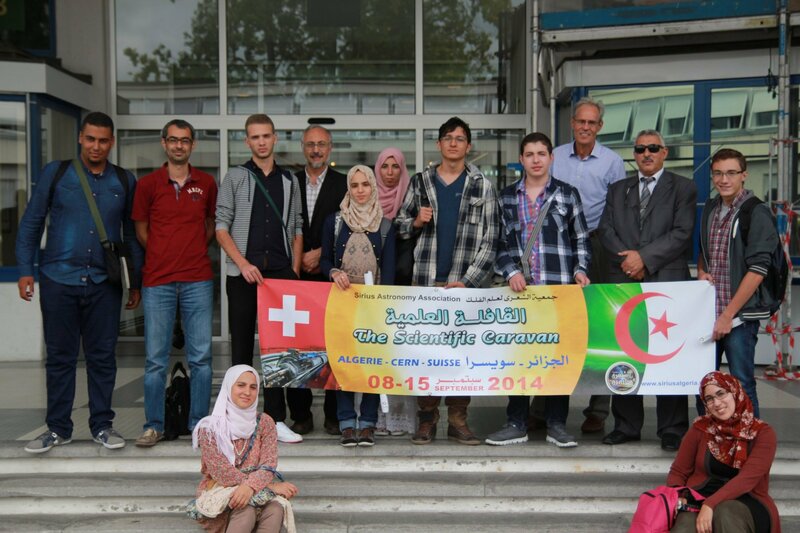 This marathon journey allowed 12 young Algerians including the three winners of the 6th Cirta-Science Competition to visit a variety of scientific and cultural sites throughout Switzerland. We were very pleased that all planned activities were meticulously executed, just like a Swiss clock! However, there was one thing that was unfortunately left out and which our delegation wished could be accomplished, and that is to visit the Algerian Consulate in Geneva. We also wanted to take such an opportunity to brief the consular staff on the aims and objectives of our visit. Despite receiving our request for a meeting via mail that included all the details of our journey and activities, we did not obtain any response from the consulate, and Sirius’s gift to the Consul – a beautiful finely engraved low relief of the city of Constantine – returned back home with us. The Cirta-Science Competition is held annually across Constantine’s high Schools. It has received increasing national and international prominence to the point where a number of organisations we have interacted with are planning to replicate this initiative in their respective countries. The initiative aims to enthuse young students about science, awaken their curiosity and nurture a spirit and culture of scientific excellence amongst them. The competition takes place over several months in coordination with the Department of Education under the patronage of the Wali of Constantine. The winners are announced on the national Day of Science and the winners announcement ceremony often includes a number of Algerian and international scientists. Winners’ prizes in previous editions of the competition included a visit to the European Space Centre in Amsterdam and Cologne in 2008, to Shanghai to observe the longest total eclipse of the century in 2009, to the giant telescope SALT located in Sutherland in South Africa in 2010, to the world’s largest telescope (Gran Telescopio Canarias) in the Canary Islands in 2012, and to the large radio telescope in Nobeyama and Mount Fuji in Japan last year. English translation by Oussama Metatla. Jamal Mimouni is an Algerian astroparticle physicist (PhD in Particle Physics in 1985 from the University of Pennsylvania). An active actor on the debate on science, society, and the cultural dimension of the scientific enterprise in the Arab-Muslim world, he is also the president of the Sirius Astronomy Association. He has authored a book entitled “The Story of the Universe: from Early Conceptions to the Big Bang”, the only one of its kind in Arabic.